I wrote my first Fletcher update just a few months after graduation, while I was still in Boston. Now, as I write my five-year update, I find myself appreciating just how many things have happened since then. At that time, without clear knowledge of my next steps, I wrote, “For now, I’ll be ready and open to the uncertainty, the world of opportunities and options that is out there.” Well, today I am writing this post from Sudan, I am married to my best friend, and I attended my first five-year reunion in May. Before I enrolled at Fletcher, I spent most of my time between my home town, Madrid, and the Middle East. I was lucky enough to land a job just after college at one of the main Spanish NGOs focused on humanitarian work in Jordan, Palestine, Lebanon, and the Balkans. As I look back, I can see how that first job defined my future: it gave me the opportunity to travel to countries where I could see humanitarian work firsthand; I had incredible coworkers who transmitted to me their passion for this field; and most importantly, it made me curious. Later, while I was working at the Madrid office for UNRWA (United Nations Relief and Works Agency for Palestine Refugees), I decided that I not only wanted a career in humanitarian work, but I wanted to make a difference by contributing to efforts to influence the context and to find solutions to key issues that cause humanitarian crises. I chose Fletcher due to the large number of international students, which I felt would influence how professors would approach their curriculum and focus on key issues. People with so many different backgrounds and amazing brains could only do great things, right? During my time at Fletcher I focused on Conflict Resolution and International Organizations, trying to complement my geographical interest in the Middle East. But, of course, one of the first things you learn at Fletcher is that there are no knowledge silos, so I was challenged by being exposed to subjects including basic economics, international law, qualitative research methods, and peacekeeping. Classes with Professors Johnstone, Rouhana, and Gideon were among my favorites. One of the hardest classes I took was Public International Law, with Professor Glennon. Tears and long reading sessions with my international law book. I made it through that class with the support of my amazing study group. Soon enough I learned that, at Fletcher, it was all about team work, not competition. The only competition was the one we had with ourselves. The fun times (as important as the intellectual ones) came through amazing Zumba classes, dance nights, culture nights, Blakeley dinners, cannon adventures, and early breakfast trips to a diner with our pajamas on! After graduation, while most of my friends were slowly leaving Medford, I stayed. I worked at Conflict Dynamics as a Research Assistant until December that year. I had mixed feelings: excitement for having a paid job just after graduation, but also anxiety about not having left Boston yet. Because nothing happens as you plan it, I started a relationship with a fellow Fletcher grad, Nathan Kennedy, who had been my roommate over the summer. And it continued after he moved to DC for his first job. I took a leap and moved from Boston to DC for six months while I was consulting part-time and looking for long-term jobs. I received the full support of his (also Fletcher grad) roommates, who hosted me as one of their crowd and supported me while I found my own way. I am still grateful to them today. I finally landed a job in Turkey to work on the Syria crisis with REACH Initiative. My research background was essential for this job. As I was packing to leave the U.S., Nathan and I got engaged. Good timing? I guess not. But if everything went as expected, he would follow me after a year — and he did. Nathan found a job in the town where I was living and we spent the next three years in Hatay, Southeastern Turkey, working on the Syria crisis. While I was based in Turkey, I traveled to Amman and Beirut, and I was also deployed to two emergencies: Haiti and Greece. My language skills and my confidence to say yes to opportunities were key. With 48 hours notice, I packed my bags and went to contexts that were totally different from what I was used to. Our wedding happened between all these deployments and travels. 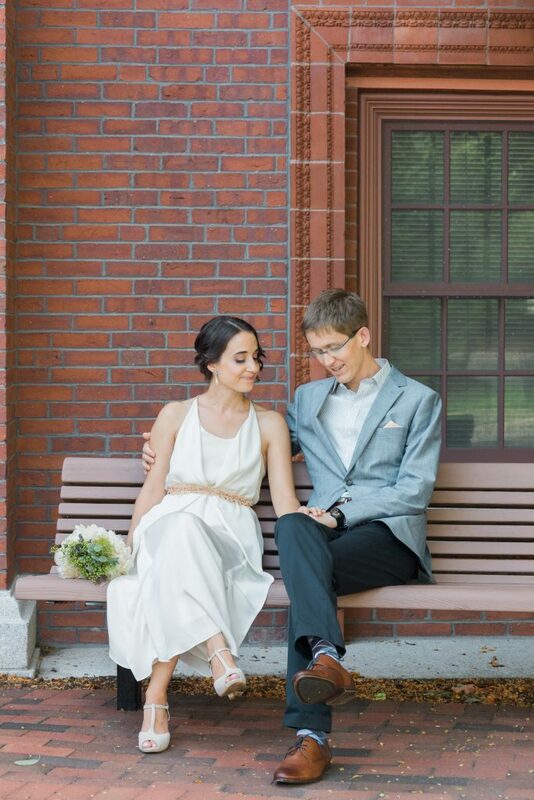 In August 2016, we returned to Boston to marry in the city that made it possible for us to find each other. Then we went back to Turkey, where we stayed until March 2017. 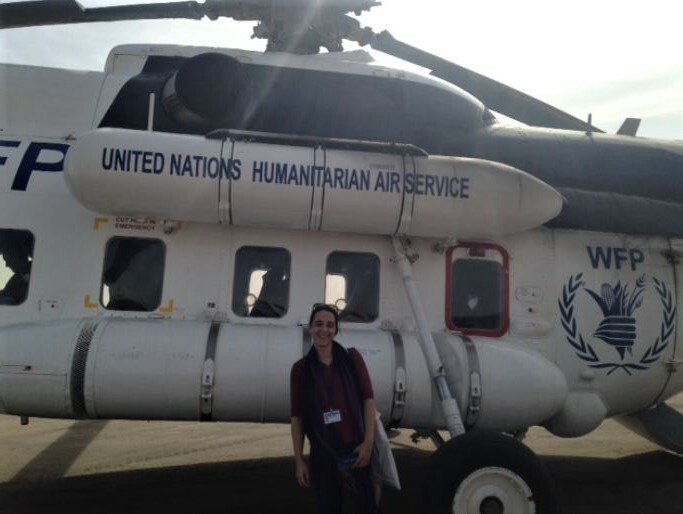 A few months later, I received an offer from OCHA, the UN Office for the Coordination of Humanitarian Affairs, to work in Sudan, where I am now. I was both excited and nervous. This job was, again, outside my comfort zone in so many ways — my first time in Africa, first time posted with the UN — and it was an amazing opportunity. But I took the leap and here I am nine months later. I work in the Coordination Section, in charge of oversight and support operations in two states in Sudan, leading the inter-sector group, as well as overseeing a team. Despite challenges over the first few months, I have learned to love and appreciate this country. Nathan joined me here recently and extraordinary friends — including other Fletcherites — help make my time here amazing. I am learning Arabic, doing yoga, traveling in Sudan, and enjoying peaceful Friday mornings while people are at prayer. At Fletcher, we were told to have confidence in ourselves, to trust, to take every opportunity, and that the sky is the limit. All of that is true, and just as Fletcher graduates shared this advice with me once, I will pass it on to all those students who are now wondering where they will end up. Be ready for “the world of opportunities and options that is out there” and you’ll find yourself somewhere amazing.